a chess program by Gyula Horváth and at times by Zsuzsa Horváth - the development already started in 1984. Pandix, written in C, has a huge tournament history, starting at the WMCCC 1987 until last recently runner-up the CCT14 in 2012. Pandix ChessFriend was commercial in the 90s as x86 PC program running under MS-DOS with an own GUI including a 3D board representation and graphics piece editor. Since 1993, Csaba Szûts is author of Pandix' opening book. Beside five World Microcomputer Chess Championships , seven World Computer Chess Championships, three World Chess Software Championships, Pandix played three Aegon Tournaments and various Hungarian Chessprogram Open, International CSVN Tournaments, Dutch Open Computer Chess Championships and Online Computer Chess Tournaments. After more than a decade of recreation and abstinence from competing in tournaments, Gyula started a comeback at the DOCCC 2008, and the WCCC 2009. Pandix Breakthrough, now UCI compliant running under Windows, played a strong WCCC 2010. In June 2011, Pandix won the ICT 2011 with 7 out of 7, and in July 2011 the WCRCC 2011 . At the WCSC 2013 in Yokohama, Pandix by Gyula Horváth started a great pursuit with 4½/5 in the second half, for a Silver medal shared with Junior, a half point behind Gold medalist HIARCS. Also the open hardware WCCC 2013 was a great tournament for Pandix, winning Bronce in the main course and blitz. Gyula Horvath started writing chess programs in 1985. His program won the Amateur World Chess Championship in 1987 and the Personal Computer Chess Champion title in 1988 and 1989. His wife, Szuzsa, joined the development in 1986. She is mainly active in testing the program and in designing and programming the graphics of the commercial versions of the program. 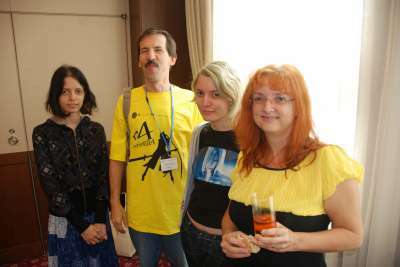 Both of them pursue chess programming as a hobby - Gyula works as a marketing researcher and Zsuzsa works as a telemarketing assistant. 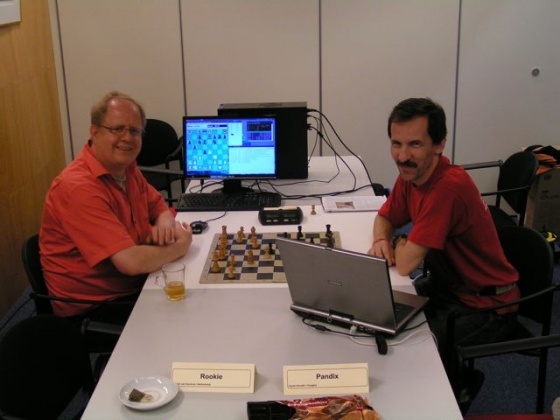 They have participated in various computer chess events since 1986. In 1993 their team increased to three members when Csaba Szûts began to implement a new 100,000 moves opening book. The program is written in C and uses a 400KB hash table. It measures the move interestingness and incrementally updates the attack map. The program uses principal variation search, advanced time control and special limited quiescence search. Between 1984-1995 I was developing Pandix. Then I stopped working on it. I just participated on the Hungarian computer chess tournaments for fun (with tiny modifications on the code). Since 2006 I develop Pandix again as a strong hobby. My aim is to create a new algorithm what is radically different from all the published sources. Eventually it seems that the invested efforts are paying back, and Pandix starts to be extremely strong. Currently it is single thread, but for the Kanazawa tournament I'll make it multi thread + egtb will be used there. (It'll be done for summer, and by the tournament it'll be well tested.) Pandix is a Windows UCI application.